Welcome to a realistic Minecraft server. In this server there are no warps to different places, instead, you have to go by bus, train, airplane, boat, or even your own car. We have subway system that takes you to all the sides of our Capital Stockstad. If you do not want to be a homeless guy you have to check in at the hotel or buy an apartment. And when the sun rises, you must have some money for food, if you don't want to die. So where do you get money? It's easy. You must look for a job. You can work at the Airport, Stockstad Arlanda Airport, as groundhandling agent or pilot (need training). At the capital transport company, SL, can you job as a bus driver, or a traindriver. 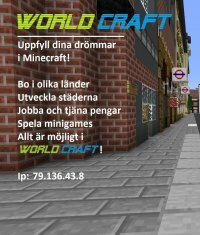 Hope you enjoy this server, Welcome to WorldCraft!